You may have heard of creatures called marsupials, maybe without realizing it! Most people have heard of wonderful animals such as Koalas, Kangaroos, and Oppossums. But most of them probably don't kno that they are Marsupials. Marsupials are mammals (animals that brth live young) that are well known for carrying their young in skin flaps called pouches. Their young are born very early (withen 9 to 42 days) and are very tiny; this is called the altrical state. They are born underdeveloped, even their hearts have't fully formed yet, but, since they are born so young, there is little risk for the mother. Only their forelimbs (the "arms") are developed enough. The reason for this is becaue, once born, they ned to climb up their mother's belly until they reach the pouch, where they'll stay from anywhere between a month to three months. While in the pouch, they will grow and develop more as they gain nourishment from their mother's milk. Since they are born so early, they have what's called a limited evolution. A limited evolution means that there is little time for the youngling to mutate, or change, while in the mother's body. Limited evolution is a bad thing in many ways. 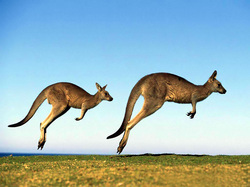 Their forelimbs must be the way they are, otherwise they will be incapable of climbing their way up to the pouch. This has left them with onlt one or two variations of their forelimbs, so, where other mammals have developed hands, hooves, and flippers, marsupials don't have a diverse assortment of forelimbs.